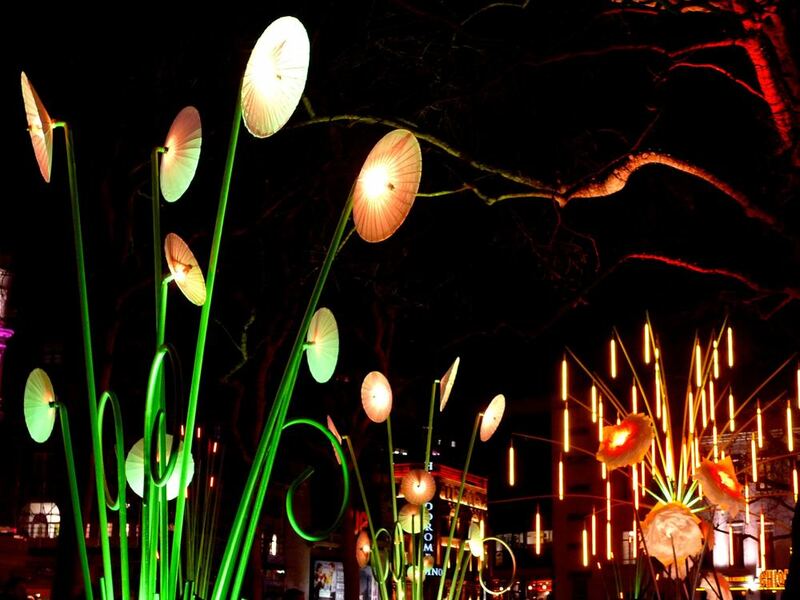 On Friday I said that my plans for the weekend included a glass of red (or two), a trip into town to see some of the Lumiere London light festival and dinner out. Well we managed all of that, some with more success than others it must be said. We combined our trip into town with a spot of dining room chair hunting - more on that another day - and as soon as we left Charing Cross on foot heading towards Tottenham Court Road we realised it was going to be a busy evening. After the chair hunting, we headed along the back of Oxford Street and then over towards Bond Street where we planned to see the installations in the Mayfair section. There were two together at the Roof Top Garden at Brown Hart Gardens, somewhere I didn't realise existed despite passing it many times before. It was crowded, so we nipped around the back and saw the installations by Sarah Blood. The bird boxes were fun and so was the birdsong in the garden, but we didn't get close to the one above as there were just too many people about. Instead of queuing we headed off towards Grosvenor Square. It was here that we realised just how busy it was as the queue to enter the garden at Grosvenor Square was spilling back onto the crossing, causing frustrated motorists to bib and hoot at the pedestrians who had nowhere to go, as entrance to the square was being controlled. And that wasn't obvious before you crossed and became the object of the motorists horn. Inside the gate we headed over to the nearest installation, which was the one below. It immediately reminded MOH and I of a picture we used to have hanging in our stairwell and it wasn't until we got home that we realised the colours were scrolling across. There were a couple more installations to see here so off we went again. Because of the sheer number of people we skipped seeing the Lightbench and completely missed the Aquarirum in a phone box. Instead we headed up towards Brothers and Sisters by Ron Haselden where we joined the throngs of people being shouted at by the steward on duty. It seems that anyone who wanted to take pictures - so most people there - should stand on the far side of the path and behind everyone else to do so. Clearly this was ludicrous as you couldn't even see the installation from there, let alone photograph it. The logic was to keep the path moving freely, only thing was it wasn't moving anywhere as people were stopping to look at the installation and not just walk past it. Surely that's what the artist intended, but the steward was getting more and more worked up because people weren't paying attention. In fact here we got talking to a lady and her husband, also trying to take pictures and also a little bemused at the instructions that everyone was ignoring! I quite liked this one, and as we approached from the side we couldn't work out what it was but as soon as we were front on, it was clear it was faces. After a non-sensical brief discussion with the shouty steward we decided to head off towards Regent Street and get some dinner. We knew there were more in Regent Street and decided that if we saw them, we saw them. And if there was time we would see more after our meal when hopefully the crowds had lessened. Things were starting to look up, this was much more what I expected. Yes, it was busy in Regent Street, but the road was closed and it's a wide road so there was plenty of space for everyone. Our plan was to head to our favourite Beak Street, which is packed with restaurants and see if any of those had a table with less than a 45 minute wait. We made it to Beak Street and quite quickly realised this wasn't our best plan as there was even a queue to get into Byron's. So goodness knows what the waiting time at Flat Iron, Polpo and such like would be. We didn't stop to check and headed onwards towards Soho, with the aim of heading towards Covent Garden. As we turned into Berwick Street we spotted Polpetto, a relative of Polpo and somewhere we'd not been before. And it didn't look that busy. So we ventured in. Ah, a 45 minute wait. But there was a seat at the bar and our feet were starting to ache. We took the seat, ordered cocktails and some bar snacks to tide us over. Before our cocktails arrived we were being shown to our table. Result. Having eaten well we left the restaurant and emerged into the wet, sloppy snow. Less than pleased we hurried towards Leicester Square remembering there were some light installations there. Then our plan was to head into Trafalgar Square and onto Charing Cross and a train home. I did see my first snowdrop in my garden last weekend, but it was nowhere the size of those in Leicester Square. There were still people around, but noticeably a different crowd given that it was now nearer 10pm and close to lights out at 10.30. So onto our last stop, Trafalgar Square. From a distance it looked as if one of the fountains had iced over - it was certainly chilly enough! On closer inspection though, the "ice" was plastic bottles. Quite effective with the light on them. So quite a mixed trip into town, but with all my objectives achieved. 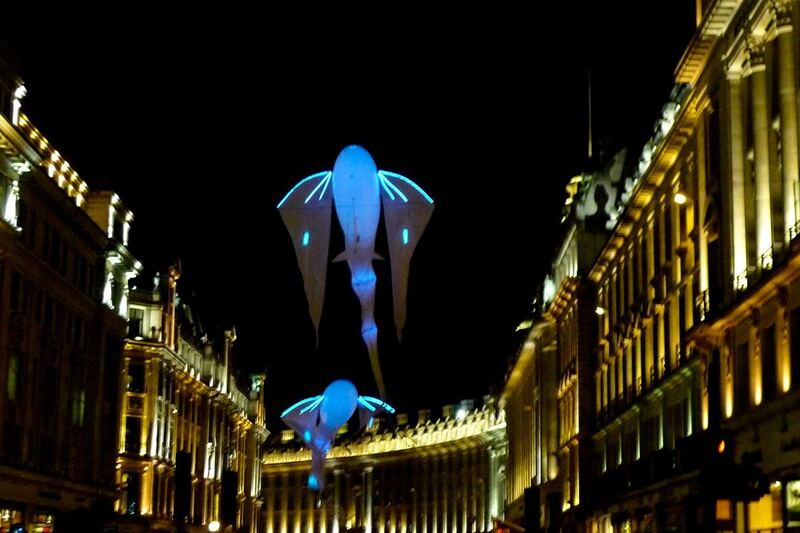 We didn't see as much of Lumiere London as we might have done, and it was (obviously) much better without the crowds. I can understand why so many people wanted to see it, but perhaps a better appreciation of how many people might attend would have helped the organisers plan better.